Thomas Ankersmit: Serge analogue modular synthesizer, computer, alto saxophone. Pre-recorded saxophone and reel-to-reel parts composed by Valerio Tricoli, with source material by Ankersmit. Mastered by Denis Blackham at Skye. Thomas Ankersmit is a 30+ year old saxophonist, electronic musician and installation artist born and raised in the Netherlands and now primarily based in Berlin who combines abstract, intensely focused saxophone playing with hyper-kinetic analogue synth and computer improvisation. He also creates installation pieces that use sound, infrasound and “modifications to the acoustic characters of spaces” that disrupt the viewer/listener’s perception of the exhibition space and their presence within it. He frequently works together with New York minimalist Phill Niblock and Sicilian electroacoustic improviser Valerio Tricoli, and other collaborators, mostly for live performances, have included Tony Conrad, Maryanne Amacher, Jim O’Rourke, Kevin Drumm and Borbetomagus. A collaborator of Phill Niblock, Tony Conrad, Maryanne Amacher, Jim O’Rourke, Kevin Drumm and Borbetomagus, Thomas Ankersmit knows how to work within a minimalist structure by tarnishing some constituents and leaving clean what’s necessary for maintaining hypnosis active. For this concise and brilliant record he was assisted by Valerio Tricoli, another frequent artistic partner (in turn, an associate of people such as John Duncan and Antoine Chessex) who pre-recorded additional saxophone parts and devised a reel-to-reel apparatus to use as a background for Ankersmit’s activities. The protagonist himself employed an alto saxophone, a Serge analogue modular synth and a computer to generate a series of phases that confirm his ability in displacing an audience through the slight modification of the way in which a predetermined sound is perceived. What starts as a dirtier version of a permanent mass of frequencies is gradually altered, either by adding interfering elements – unequal squeaking and squealing, dynamic and textural unevenness, a general smell of malfunctioning mechanics – or by superimposing adjacent strokes that transform a static ground into a swamp of scarcely predictable occurrences. Certain details are magnified and placed at the forefront in the mix, others are left behind but still contribute to the creation of the fundamental drone. For about five minutes, starting from the eighteenth, we remain without that substantial accumulation: all one hears is an incessant ringing cycle, first alone then followed by unfathomable growths which progressively augment the sonic tissue. It’s a welcome moment of genuine stasis, both in the music and in our own psychophysical equipment, and an intelligent move in the performance’s arc. The final section brings us back to the beginning, perhaps even more gratifyingly: synthetic pulsations originating a somewhat anxious quietness are reinforced by the layering of bagpipe-like reeds, electronics and noise – you can really “see the light” at that point – then become increasingly malnourished until silence falls. Worthy ending for a stirring set. “Live in Utrecht” is the first official release from Dutch artist Thomas Ankersmit, which is hard to believe when you listen to this 40-minute piece. Ankersmit’s main source of sound is saxophone, but he masterfully disguises the horn with the use of modular synths and a computer. The result is a captivating work that jockeys between sinus-clearing drone, minimalist glitch and swirling synth waves. The piece starts off with layers of buzzing sax, each layer rising and falling upon the next, with a few shrill skrees and rusty valve clicks way off in the distance; it’s sinister and unsettling, but never corrosive – one of Ankersmit’s many strengths. Suddenly, the swarm stops, leaving only high-pitched frequencies and barely-there analog pops, almost similar to parts of Kevin Drumm’s “Imperial Distortion,” but not as monolithic. Juxtaposing this thick mass of drone and against such an austere dynamic shift has utterly captivating results. Ankersmit pulls you right into his world of charcoal greys and shades of white, displaying great patience as he gradually increases the intensity. High-register tones subtly oscillate against each other amidst bursts of synth static until Ankersmit’s penchant for abrupt sonic shifts emerges again, leaving behind only a faint whisper, then dead silence. Only after nearly ten minutes of minimal feedback work does the buzz introduced at the beginning of the piece make a mournful, beautiful but brief return. This “live” drone recording is the debut solo cd from Berlin-based installation artist Thomas Ankersmit, who has previously collaborated/played with the likes of Phill Niblock, Tony Conrad, and Kevin Drumm. One single 39 minute track, this is some dense, abstract, trance-inducing drone indeed, and certainly sounds like more than a mere one-man operation. Ankersmit’s drones are like multiple trains running on more or less parallel tracks, diverging and then joining together again, racing ever onwards towards a self-generated brilliant white light at the end of the tunnel. There’s some squeal and squiggle to these sounds, that arise from their origin within Ankersmit’s saxophone – that’s right, he plays the sax, so these are saxophone drones – but there’s really only a few places where you can tell for sure the source is a sax, thanks to all the electronics and processing involved. In addition to alto sax, Ankersmit makes use of a computer, analog synth, and pre-recorded reel-to-reel tape. So his sax is set amidst much mysterious glitch and crackle, and takes on an ominously distorted, grinding quality that’s quite unlike what you might expect to hear from a saxophone. Although it makes sense that he’s also had some sort of association with the notoriously noisy sax and guitar outfit Borbetomagus, the music here isn’t assaultive, and far from free jazz, no, it’s simply, or perhaps not so simply, a gorgeous and varied dronework, one that passes through some quieter stretches of eerie subsonic hum and hiss, while ultimately massing towards the end into full-bodied solid drone purity, blissful and glorious. Pretty darn satisfying, we think our fellow drone-heads will agree. Looking forward to hearing more from Mr. Ankersmit as well. Recommended! Electroacoustic Improvisation (eai), in the tradition of misleading genre monikers, needn’t be acoustic, electronic, or improvised. Although purely electronic eai albums can be transcendent — for example, those of Sachiko M, Toshimaru Nakamura, and Otomo Yoshihide’s Good Morning Good Night — I am of the opinion that the genre is at its best when the electronic mingles with the acoustic. The convolution of the two — whether separate but together, or as the electroacoustic — expands the language of the musician, allowing for a richer sonic palette. Through this fortification, new, unique sounds are born, some of which are both the most beguiling and beautiful I’ve heard in my short life. Throughout his career, Thomas Ankersmit has displayed a keen awareness of the possibilities unlocked by this synthesis. For the past 10-plus years, The Dutch-born Ankersmit has augmented his alto saxophone with various electronic components, resulting in a bevy of live performances, sound installations, and collaborations. Ankersmit’s first full LP Live In Utrecht mixes the aforementioned alto with an analog synthesizer, laptop, pre-recorded sax, and tapes composed by Valerio Tricoli. As far as I can tell, the live sax is only treated to amplification, thus distinctly placing this record in the electro-acoustic, not electroacoustic, domain. Often, some of the most memorable music of this ilk comes in duo form — Greg Kelley and Jason Lescalleet, Tetuzi Akiyama and Toshimaru Nakamura. In a way, Ankersmit is improvising as two halves of himself, his live alto with his electronics. This ‘duo’ results in a layered drone that builds, fades, then grows again during this nearly 40-minute track. It’s remarkable how well this live performance has been captured. The tones that make up Live In Utrecht can be utterly immersive at times. It is as if in each play the listener is sitting in one of Ankersmit’s installations, triangulated between a multitude of channels, drowning in their sound. The sax’s voice is ever-present in this set, yet it’s difficult to discern from where it originates. For instance, around five minutes in, amidst short-cicuits and a synthetic hum, you hear a squeal in the upper register of the alto. The tone barely sounds treated; just enough to make one wonder whether it is pre-recorded or indeed Ankersmit’s acoustic instrument. This ambiguity persists throughout the entire album, forcing the listener to focus on Live In Utrecht’s aesthetic value, as opposed to its process. Live in Utrecht is de eerste officiële cd die Thomas Ankersmit op de mensheid loslaat. Deze liveopname uit 2007 onderstreept meteen de belofte die de naar Berlijn uitgeweken Nederlander in zich draagt. Ankersmit maakt naast (geluids)installaties ook op zichzelf staande improvisaties waarbij hij zich voornamelijk op saxofoon, analoge synths en computers baseert. Live in Utrecht vangt aan met monotone, abstracte saxofoonklanken die met tal van elektronische afwijkingen geconfronteerd worden. Deze wisselwerking tussen semistatisch uitgesponnen klankentapijten en flitsende onregelmatigheden, die zich als luizen in de pels van de compositie nestelen, zorgt voor een gespannen textuur. In de loop van de opname wordt deze spanningsboog op drie verschillende manieren gemaakt, waarna in de goede regel van de dialectiek de synthese een nieuwe voedingsbodem vormt. Dat de muziek ook op cd overeind blijft, spreekt in het voordeel van Ankersmit. Zijn eerdere samenwerkingen met Tony Conrad, Maryanne Amacher, Jim O’Rourke, Kevin Drumm en Borbetomagus hadden de verwachtingen hoog gespannen. Ankersmit lost ze in. ‘Live In Utrecht’ is Thomas Ankersmit’s first official release, appearing on Touch sister label, Ash International. It documents a live performance in late 2007, featuring Ankersmit manipulating Serge analogue modular synthesizer, computer, and his favoured instrument, the alto saxophone, together with reel-to-reel parts composed by long standing collaborator Valerio Tricoli. Over the duration Ankersmit investigates vivid electro-acoustic spaces with a deft appreciation of minute detail and spatial awareness resulting in a sequence of intriguing improvised tonal textures. Ankersmit has also worked with Maryanne Amacher, Tony Conrad, Jim O’Rourke, Kevin Drumm and Phill Niblock. It’s been a while since I’ve heard from Ankersmit. I recall, maybe 9 – 10 years ago, when I was writing for All Music, that he sent me a 3-inch of solo alto that I reviewed for the site (still there!). I think he may have printed only 100 or so copies and I like very much the notion that I could place it on such a site, on equal footing with the latest major pop release. According to the accompanying insert, this is his first full-length CD and it’s a damned good one. Recorded in November 2007 – I’m not sure if he was actively engaged in collaborating with Phill Niblock but it seems to me one can clearly hear an influence. Working with electronics and tapes as well as his alto (some of the tapes including pre-recorded saxophone by Valerio Tricoli), he constructs a dense swarming drone in some ways not unlike various aspects of Niblock’s work. But with the drone, there’s a ton of dirtiness, of sand in the mix, of harshness. Indeed, the electronic sputters that weave alongside the electronic hums and saxophone squeals have such a physical, visceral presence that I several times looked anxiously at my speakers fearing some loose connection or other damage. But those sounds play a crucial role in the first half of the 39 minute performance, removing the music from a simple, if dense, drone, causing a real discomfort in the listener, like sharp jabs to the chin. Riveting stuff. Almost halfway through, it subsides into somewhat less grainy territory, full of keening and flutter, with some strong subsonics. It’s less aggressive, but perhaps more alien-sounding; one can imagine a live situation with the various sounds engulfing the listener from multiple speakers. Within ten minutes, it’s surging mightily, only to be lopped off once again. But back it comes, this time the drone is richer, more strident, retaining some grain but really concentrating on the “loud hum”, sounding like bass vuvuzelas processed to remove some of the burr. It’s a powerful performance – glad to have Ankersmit back. 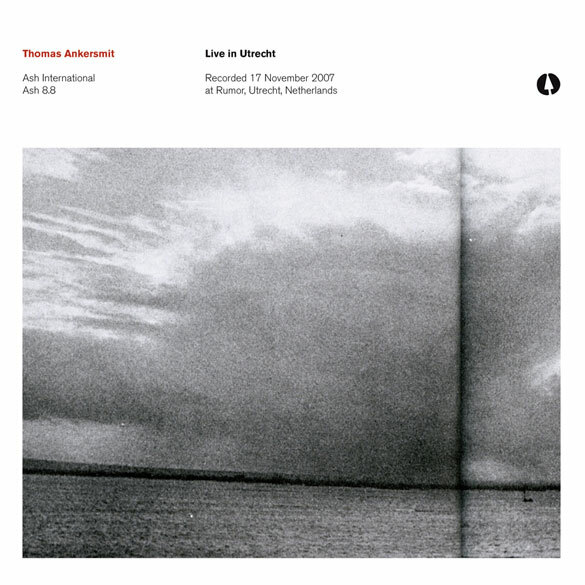 Unschwer zu erraten: auch Thomas Ankersmit´s Debut „Live in Utrecht“ ist live eingespielt. Der 30-jährige Niederländer spielt Saxophon und elektronische Instrumente. Er erarbeitet Installationen, die sich mit Klang, Infraschall und Änderungen der akustischen Eigenschaften von Räumen befassen. Die Aufnahme besteht aus einem einzigen, knapp 40 minütigen Stück, das bereits vorher aufgenommene (verfremdete) Sax-Parts des sizilianischen Improvistionskünstlers Valerio Tricoli integriert, der auch man der Komposition beteiligt war. Mit Hilfe eines analogen Modular-Synthies und computergenerierten Sounds entsteht eine flirrende, fiepende Soundkulisse. Minuten lang besteht die Aufnahme fast nur aus einem Pfeifen, das eher an ein Störgeräusch erinnert, bevor das ganze wieder etwas Fahrt aufnimmt. Hinterlässt mich eher ratlos – ist im entsprechenden räumlichen Setting live sicher etwas anderes, als auf der heimischen Anlage. Nur für Spezialisten und unerschrockene Klangforscher ohne Haustier zu empfehlen. Första gången jag hörde den unge nederländske altsaxofonisten Thomas Ankersmit uppfattade jag det som ett radikalt genombrott i den segslitna estetiska tvekampen mellan akustiskt producerade ljud och det elektroniska. Att smälta samman gränserna är relativt enkelt att få till, men att efterlikna elektroniken med helt akustiska medel och dessutom göra det med övertygande kontroll och precision är inga självklarheter. För snart tio år sedan, i ett svart oansenligt cdr-omslag med en 3”-cd och en e-postadress, levererades en sådan knockout. Så kommer nu äntligen nästa fullträff, då Ankersmit skiftar perspektivet och med hjälp av till större delen elektronik åstadkommer en övervägande akustisk känsla. Även om Ankersmit tidigare använt flerkanalsteknik var resultatet likväl häpnadsväckande. Här vilade någonting nytt, något kommande. Men produktionen förblev ytterst sparsmakad. Det kom en till cdr-skiva, en split-lp med Jim O’Rourke och några samarbeten med Kevin Drumm. I intervjuer säger han själv att han medvetet håller en låg profil och gör sig hörd när det är så dags. Han är självlärd saxofonist, utan något särskilt intresse för jazz eller improvisation som sådant. Huvudsakligen är han engagerad i konstvärlden med flertalet ljudinstallationer och intrikata akustiska koncept. En som tidigt såg Ankersmits potentialer var kompositören Phil Niblock och tillsammans har de gjort många turnéer och framföranden. Det är ett samarbete som pågår fortfarande (senast på GAS-festivalen i Göteborg). Niblocks ande svävar också över den nyligen utkomna fjärde skivan Live In Utrecht. Det är ett stycke på drygt 38 minuter som i långa, dronande och pendlande rörelser bildar en intensifierad form utan att använda det lättköpta tricket att stegra kompositionen mot klimax. Riktigt intressant är som sagt att Ankersmit trotsar all impropuritanism och ger sig hän åt elektronik och digital teknik. Inspelningen är som titeln avslöjar en livesession, men mycket av saxofonen är förinspelad och kommunicerar med en laptop, en analog modulsynt och diverse taper framtagna av den elektroakustiske kompositören Valerio Tricoli. Voila un artiste sonore qui aime explorer les tensions ; celles entre sources acoustiques et électroniques, entre improvisation et composition, entre frontières du domaine audible et perception. Peut être aussi une petite tension vis-à-vis du support audio à usage domestique ? Bonne nouvelle, celle-ci n’a pas empêché la parution de ce disque impeccable, premier éclairage significatif de son travail en solo. Après plus de dix ans d’activisme sonore (improvisation, composition, installations, organisation de concerts), la notoriété de Thomas Ankersmit ne semble pas dépasser le cercle de ceux ayant eu l’opportunité d’assister à l’une de ses performances publiques. Bon, c’est vrai, ça commence à faire du monde au rythme où il enchaîne les apparitions un peu partout en Europe, avec une présence dans pas moins de huit festivals en France au cours des trois dernières années. En revanche, le vide est sidéral concernant sa discographie : deux CD-R autoproduits en édition ultra-limitée (dont l’un en collaboration avec Kevin Drumm), un split LP avec Jim O’Rourke en 2005 etŠ c’est tout, jusqu’à présent ! Inutile de préciser que ce Live in Utrecht, première parution d’Ankersmit en solo digne de ce nom, est un disque que d’aucuns désespéraient de voir sortir un jour et qui, du coup, est sérieusement attendu au tournant. Résultat : l’essentiel de ce qui fait la patte de ses constructions électroacoustiques complexes est ici retrouvé et on n’est pas déçu. En première approche, la musique d’Ankersmit peut se voir comme le reflet direct de son parcours éclectique, ballotté entre les Pays-Bas (sa terre natale où il débuta ses expérimentations), New York (où il passa quelques temps à la fin des années 1990, faisant copain-copain avec Borbetomagus ou Phill Niblock) et Berlin (dont il est maintenant résident et où il s’immisce à l’occasion dans les scènes noise et improvisée). Même s’il a adopté le saxophone alto depuis longtemps, Ankersmit reconnaît être incapable d’en jouer de manière conventionnelle et a exclusivement recours aux techniques étendues (souffle continu, polyphonie) qu’il a développées en autodidacte. L’instrument est exploité de cette manière pendant les premières minutes, s’accumulant en strates vibrantes dont la densité fournit un socle timbral à divers parasitages électroniques en provenance des entrailles d’un synthétiseur modulaire analogique, d’un ordinateur ou peut être des bandes de Valerio Tricoli dont certaines sont ici utilisées. Une imposante masse sonore se développe lentement, augmentant sa circonférence et multipliant les éléments qui la composent. La musique est « plutonique », à l’image du granite dont l’aspect compact révèle une infinité d’incrustations au fur et à mesure que l’on s’en rapproche. La substance semble ensuite se réduire sous les coups de meule qui en attaquent la surface et en découvrent les couches les plus profondes. De nouveaux détails se révèlent : arcs électriques, fréquences oscillant dans les limites extrêmes de l’audible et s’unissant en un drone implacable même si rongé de toutes parts et libérant des particules qui se projettent dans de multiples directions. La dépressurisation se poursuit d’avantage pour atteindre un infime volume sonore où d’autres corpuscules scintillants folâtrent au sein de textures toujours aussi grenues. La température finit enfin par s’élever progressivement jusqu’à devenir écrasante, agitant les molécules environnantes et augmentant le rythme de pulsations irrégulières. Le saxophone fait son retour dans l’ultime segment de cette pièce à la structure relativement symétrique et renoue avec l’intensité liminaire, sur un pied d’égalité avec le meilleur du minimalisme rugueux made in NYC. Auspiciosa estreia nos domínios da exploração sónica. A capa pode levar ao engano: uma foto granulada de uma paisagem marítima coberta por um céu imenso, um lettering sóbrio. Pensamos logo que estamos perante mais uma inútil descarga de jazz pasmacento ECM. Não é o caso mas, apesar de tudo, a referência visual à editora alemã pode fazer algum sentido, uma vez que é na label de Manfred Eicher que encontramos os discos do Electro-Acoustic Ensemble de Evan Parker, onde se localizam óbvias afinidades com este som. Com uma ligação próxima ao compositor minimalista Phill Niblock, o holandês Thomas Ankersmit elabora as suas explorações sonoras utilizando como ferramentas o saxofone alto e electrónica (laptop e sintetizador modular). Apesar de incluir no currículo colaborações com gente obrigatória/genial como Tony Conrad, Jim O’Rourke, Kevin Drumm ou Borbetomagus, este disco gravado ao vivo é o primeiro volume da sua discografia, uma estreia que acontece aos 30 anos. Ao longo de uma faixa única de quase quarenta minutos, Ankersmit manipula electronicamente o som, a sonoridade do saxofone fica por vezes escondida, imersa na electricidade, outras vezes está mais saliente, por vezes simplesmente ausente, irreconhecível. Há momentos em que se ouve apenas um ligeiro fio de electricidade suspenso no ar, como burburinho de robots durante um coffee-break, para depois eclodir o som contínuo do saxofone, numa morosa implosão. Thomas Ankersmit is a 31 year old musician based in Berlin and Amsterdam who personifies, even in this small corner of the sound universe, terms like recondite and low-profile. With only a few ridiculously-limited releases behind him [duos with Jim O’Rourke and Kevin Drumm, the latter being essentially an Ankersmit solo work with his reworking of a single Drumm base track], Live In Utrecht comes to us out of a great silence. Consider, then, a few more dimensions of Ankersmit’s sparse output-Live In Utrecht is barely 39 minutes in duration, was recorded in 2007, and owns none of the qualities suggesting an agenda of amending Ankermit’s long recording drought with a perfectly shaped, worked over opus magnum. Bringing to the momentous occasion of his first proper release, supported by the considerable promotion and distribution imprint of Touch [actually released on the Touch subsidiary Ash International], is Ankersmit’s sound generator of choice- the saxophone. For many improvisers in this stage of the game, the saxophone is arguably a self-selected liability. Certain to raise the hackles of the legions who argue the sax is still being used to create new and vital work, I approached Ankersmit’s Utrecht performance, with its instrumentation listed as alto sax, computer and synths, with a milder version of Diaghilev’s entreaty to Cocteau-astonish me! [Coupling a young, untried poet’s text with the music of Satie justifies Diaghilev’s high-bar demand-but I digress]. If you suffer a similar satiety where saxs are concerned, you will find in Ankersmit’s sound world a welcome subversion of expectations. Even more potently, you can hear an improbable fusion of sonic elements that might seem, on paper, as being at loggerheads- the economy, pitch-sculpting and symphonic partials of Phill Niblock, braided together with the yakuza sax squeals and squalls of Borbetomagus. Ankersmit is working on what has been spoiled in these respective, seemingly dualistic musical lineages- intuiting as he has that the serenity of Niblock’s drones include much that is disquieting, and that the surface abrasions and harshness of Borbetomagus can serve to burnish, polish and refine what the ear initially hears as noise. So on this occasion Ankersmit unspools a 38 minute skein of countless micro-events; initially carried along by a slightly unstable, reedy sustained drone, the music lurches and caroms, at times scarcely under control, pitching forward before collapsing into several episodes of near silence. Ankersmit encrusts his droneage with striations of pre-recorded sax lines [the contributions of Valerio Tricoli], ungainly, piercing upper partials, stacked throbs and pulses, and supernova bursts of freak register sax squeals. As soon as he has established this meticulous cacophony with frightening velocity and forward momentum, Ankersmit will deliver a hypostatic drop to a tiny, fragile pitch or buzz, and begin rebuilding and amassing anew. Without intending a spoiler, I must say the concluding 10 minutes or so, with its incremental movement toward a gorgeous cloud of sustained, massed reeds, is awesome. True to the overarching form of the entire piece, the mighty cloud of ecstatic sax voices get teased apart and distilled to a single frail line that fades as it emerged 38 minutes earlier. Like Maryanne Amacher [R.I.P. ], whom I suspect might be an influence, Ankersmit’s sound-sculpting clearly would benefit from the in situ experience. Like Amacher, Ankersmit has been involved for some time with installation projects and reportedly pushes the air around with no small attention to the particular acoustic properties of a chosen space, not to mention the potential power and potency of playing loud. The great discovery for me in this release is how Ankersmit is working on what has been spoiled by the inevitable, organic rotting of every played out area of sound; the balls-to-the-wall sax assaults hobbling many moribund free improvisers, and the steady-state ennui afflicting many drone artists. Ankersmit’s work reinvigorates and fructifies these stagnant pools through their intelligent and visceral fusion. Live In Utrecht is among the most exciting music I have heard in some time. His tour itinerary for the balance of 2010 has him alternating between stints with Niblock and Borbetomagus. He’ll have no trouble crossing between these realms- Live In Utrecht does just that, and single-handedly. D’un commentaire à l’autre, on parlera de Thomas Ankersmit comme d’un saxophoniste, ce qu’il est, soit comme d’un musicien électronique, ce qu’il est également. Comme beaucoup d’instrumentistes « traditionnels » qui sont passé à d’autres pratiques, que ce soit pour se mettre au synthétiseur, au laptop, au révox, au dictaphone, l’idée d’appliquer d’autres méthodes de travail n’empêche pas une fidélité au son de l’instrument d’origine. La musique de Robert Hampson, Christian Fennesz ou Giuseppe Ielasi continue ainsi à sonner étrangement comme de la guitare, même si tout l’en éloigne. Celle de Thomas Ankersmit continue elle à sonner comme son sax soprano d’origine malgré les mutations que lui font subir ici le musicien et son acolyte Valerio Tricoli, qui se charge de l’enregistrement, du mixage et des prises de sons préalables utilisées lors de ce concert. Superposition de pistes, redoublement électronique, multiplication exponentielle des occurences , le début de ce live est une accumulation progressive de clones du soprano de départ, une masse qui enfle pour se briser, à peine stabilisée, en un redécoupage chaotique, aux coutures abrasives, qui rappelle à l’auditeur du disque que ce saxophone décuplé est piloté par une puissante machine électronique, un fort beau synthétiseur modulaire Arp, qui, tout en maintenant presque intacte la tonalité du début va par contre réduire en charpie la structure linéaire de départ, et la remplacer par des conflits de boucles, des loops contradictoires, des micro-accidents en chaîne, des sonorités qui mettent en avant la présence de l’électricité. Tout cela s’arrêtera net, à mi-parcours de l’album, comme en reprenant son souffle, pour se voir remplacer par un tone purement électronique, prémisse à un nouveau départ. Faux drones de vrais cuivres, vraie agitation hyperkinétique derrière l’illusion de stabilité, le concert que reproduit ce disque devait rappeler aux spectateurs les montagnes russes tant il alternait les dynamiques, les tensions et les moments d’apaisement. S’il est actif depuis plus d’une dizaine d’années, aux côtés de gens comme Phil Niblock ou Kevin Drumm, la discographie solo de Thomas Ankersmit est encore trop rare, ce qu’on regrette d’autant plus à l’écoute de disques aussi réussis que celui-ci. Comme le malheur des uns fait toujours le bonheur des autres, les errances (relatives) de Jana laissent le champ libre à un talentueux outsider : Thomas Ankersmit. On ne sait pas grand chose du trentenaire Hollandais, si ce n’est que celui-ci a collaboré avec Jim O’Rourke, Kevin Drumm et Phill Niblock – ce qui en soi devrait suffire à s’arrêter sérieusement sur le cas Ankersmit. Premier disque donc, qui retrace une performance live enregistrée à Utrecht en 2007. Trente-huit minutes à couper le souffle : basé autour d’un saxophone alto préparé, Thomas Ankersmit balance sans cesse entre bourdonnements électriques, infrabasses ultra-technologiques et electronica signalétique. L’écoute au casque témoigne d’une précision difficilement croyable en improvisation, faisant jeu égal avec les génies que peuvent être Ryoji ikeda ou Pan Sonic à leurs meilleurs niveaux. Une vision totalement inédite et pertinente du drone 2.0. Indispensable (à condition de coacher préalablement ses oreilles). Nous avions été agréablement surpris, pour ne pas dire sous le charme suite au set que Thomas Ankersmit proposait au festival Présences Électronique en mars 2009. C’était la première fois qu’on le voyait sur scène, on le découvrait alors, et nous avons aujourd’hui la possibilité de retrouver l’ambiance live de l’artiste néerlandais grâce à cet enregistrement d’un concert qu’il donna à Utrecht en novembre 2007. La sortie de cet album live est un petit événement dans la mesure où il s’agit du premier album solo de l’artiste. Étonnant alors qu’à 30 ans Thomas Ankersmit a déjà quelques années de pratique et une certaine reconnaissance, mais le néerlandais semble privilégier les performances live, tout en étant très actif dans le milieu de l’art contemporain avec des installations sonores. On retrouve sur cet enregistrement tous les éléments qui composaient le set de Présences Électronique. Thomas Ankersmit se produit au saxophone, synthés analogiques et ordinateur, combinant tous ces éléments afin de produire une musique qui va piocher dans l’improvisation, les drones, l’ambient ou encore une electronica expérimentale, faite de glitchs et cassures. Live in Utrecht se compose d’une piste unique de près de 40mn qui se révèle excitante de bout en bout, pleine de relief, de fourmillements, de vie, mais aussi de développements justement dosés. Chez Ankersmit le drone n’est pas une fin en soi, juste sa manière de créer des nappes et textures ambient qui sont rapidement enrichies de souffles, craquements et grincements. Sa façon de jouer, de composer avec les erreurs numériques est assez bluffante, avec ses bruitages jetés en pâture pour apporter de la matière, ses grincements oscillants et jouant avec la stéréo pour se révéler hypnotiques, ou encore ses frétillements quasi rythmique donnant une impression de densité et de fourmillement. Le concert débute en privilégiant l’acoustique avec dans une premier temps des drones flottants, et très vite l’électronique s’en mêle, tant pour traiter les sonorités du saxophone que pour apporter vie, textures et richesse. À mi-parcours, après de nombreuses variations autour de ces drones de cuivre, Ankersmit se concentre sur l’électronique avec une ambient minimale, faite de micro-sonorités, sifflements aigus et chuintements que l’on pourrait attribuer à des souffles retenus, comme si l’artiste improvisait, jouant avec l’embouchure de son instrument. Après quelques tentatives, le saxophone revient de plus belle sur les dix dernières minutes, reprenant le dessus sur l’électronique avec un son épais, puissant, avant de s’effacer dans un drone épuré. Pas d’uniformité dans les musiques abruptes, on ne peut pas tout mettre dans le même sac au prétexte que les écoutes sont difficiles. Rien à voir en effet entre disques théoriques, placages sonores d’hypothèses intellectuelles et les expériences plus immédiates et intuitives. Pour Keith Fullerton Whitman ou Thomas Ankersmit, la musique se joue surtout désarmée, c’est à dire sans écriture. Disingenuity b/w Disingenuousness est un disque en partie improvisé, qui en tout cas respire plus l’association libre que l’édifice mental structuré. Live in Utrecht est comme son nom l’indique un enregistrement en prise unique, premier objet officiel pour un activiste de longue date qui n’avait jamais rien fixé de son œuvre. Ces deux courts albums de quarante minutes chacun ont ce trait commun d’être en constante palpitation, dans une incertitude et une charge de l’instant qui les rendent passionnants, passionnants pour la beauté de leur son, bien sûr, mais aussi par le suspense narratif qu’ils possèdent – on ne sait pas où ça va et ça nous tient en haleine comme rarement musique expérimentale a pu le faire. Two accomplished sound explorers – a veteran New York-based American and a younger Dutch-born, Berlin resident, independently probe the timbral limits of electronically processed saxophones. Both CD’s are engrossing, with the American’s probably more so, since he’s primarily known as a guitarist. That person is Elliott Sharp, who during the past couple of decades has evolved a individual catalogue of works touching on Blues, Jazz, Rock, Improv, Contemporary Classical and electronic music. He has played solo, in the Terraplane combo and in collaborations with players as different as guitarist Scott Fields, violist Charlotte Hug and turntablist Christian Marclay. Someone who occasionally adds reed lines to his improvisations, on the seven tracks here Sharp concentrates on tenor and soprano saxophone, modulating the woodwind output through computer-processed analog and digital synthesizers and adding drum samples from Joseph Trump, Sim Cain or Tony Lewis. Live in Utrecht on the other hand consists of one extended track played by Thomas Ankersmit on alto saxophone, altered and amplified with pre-recorded saxophone and tape parts enhanced by a computer and analog modular synthesizer timbres. Someone who often works with New York minimalist and film-maker Phil Niblock and Sicilian electro-acoustic improviser Valerio Tricoli, this CD captures an installation piece from Ankersmit that depend on the space’s acoustic characteristic. During the course of this almost 39-minute performance, Ankersmit varies his saxophone line and various whirling, spluttering wave forms through episodes of unexpected fortissimo timbres and chapter-marking protracted silences. At times propelling the aural grisaille to sonic three-dimensional results, he simultaneously mixes reed shrills, mirrored and concentrated sonic asides, plus all the properties that arise from engendering a soundscape consisting of, among other timbres, accelerating wave-form crescendos, signal processed rattles and flanged, and almost aviary flitters, in addition to circular pulses. The oscillations gradually diffuse and granulate while crowning a connective ostinato of pure resonance, until interrupted by dead silence, and then replaced by reductionist crackles, distracted air bubbles and solid drones. Eventually reed sounds vanish to be replaced by identical reverberating buzzes and what sounds like typewriter key clacks mixed with bird chirps. Eventually, following other pauses, echoing harmonica-like reed parts reappear, building up to harsher and more atonal timbres. Climatically the nasal reed tone and its related partials dissolve into strident, chanting whines. Conversely, with his creations spread over a few tracks, Sharp has no need of time-marking silences. At the same time his layered and granulated multiple reed lines not only quicken and narrow to sluices and flutters, but also gain additional shape from thumping drum samples and the coarse friction of machine-processed warbles. A piece such as “Vortex Field”, for instance melds robotically accompanies drum machine pulses with a broken chord set of saxophone split tones. Eventually as the fluttering wave forms downshift, snorting rumbles are modified into ney-like reed trills. Similarly a rock music-like backbeat from the percussion on “Metelegy” accompanies a series of splayed and layered saxophone vibrations. Then a miasma of distorted guitar flanges, processed whirls and altissimo reed cries attain a common finale of pressurized, twisted squeaks. “Manaus”, the lengthiest and concluding track, draws on variants of all these strategies. Balanced are low-pitched, resonating drum samples, dial-twisting and tumbling synthesizer whistles and Orientalized soprano saxophone reed chirps. As supplementary smears of colored sounds are added, a tapestry of Art Nouveau-like sonic decorations and timbral palindromes enter into the equation, with flutters, shrills and aviary-like chirps predominating. The concluding variation diminishes the oscillations for an emphasized series of squeaking, irregular vibrations. More than unaccompanied saxophone showcases, with enough breadth to affix reed sounds to pre-recorded samples or outright electro-acoustic sequences, Ankersmit and Sharp may have created unique sonic forms. They’re certainly sounds that should be heard. Je profite de la venue imminente de l’artiste hollandais au festival Cable# (Nantes) pour parler de son dernier disque. Après deux autoproductions maintenant introuvables et un split avec Jim O’Rourke, Ankersmit nous délivre enfin un disque solo. Pour commencer ce live formé d’un seul morceau, il y a une longue et aérienne nappe sonore, d’apparence fixe, elle est tout de même mouvementée comme une note pourrait l’être par un vibrato. Mais Ankersmit a l’esprit dialectique, et la confrontation des contraires ne se fait pas attendre. Très vite, des signaux dignes d’un John Wiese en version minimaliste et éthérée s’ajoutent, s’opposent, et interfèrent avec notre nappe sonore initiale. Ses mêmes signaux en viennent à se transformer eux-mêmes en une nappe toujours mouvementée de l’intérieure par un balancement/vibrato obsessionnel. Description très succincte et très partielle de ce qui peut se passer durant ce live. Ce à quoi je voulais en arriver, c’est surtout à cet aspect dialectique de la musique d’Ankersmit. Très noise, dissonante et saturée, elle n’en est pas violente pour autant, il y a toujours quelque chose qui vient adoucir et équilibrée le moindre élément agressif. Très minimale et abstraite, cette musique n’en est pas pour autant insensible ni exempte d’émotions, et une forme harmonique de beauté intervient régulièrement au milieu des interférences sinusoïdales et des imperfections sonores saturée. L’utilisation de l’électronique est également contrebalancée par le synthé analogique et le saxophone, ce qui permet d’échapper à l’aspect parfois trop abstrait de l’improvisation électroacoustique. Toutes les frontières se brouillent et se confondent dans cet enregistrement entre architecture sonore, improvisation électroacoustique et musique concrète, l’équilibre est parfait, l’émotion immense, notamment grâce à la structure organique et dialectique de cette composition instannée. J’espère que d’autres documents viendront compléter la mince discographie d’Ankersmit, d’autant plus que sa musique, dans la mesure où la spontanéité n’est pas le principe de composition, se prête particulièrement bien à l’écoute privée. En attendant, je ne peux que vous conseiller de gouter cette interpénétration géniale des modes de jeux et d’écritures qui abolissent les conventions musicales pour mieux dévoiler de nouveaux horizons. Urodzony w 1979 roku Holender Thomas Ankersmit to jeden z mniej znanych, ale na pewno zasługujących na uwagę muzyków tworzących w nurcie improwizacji elektro-akustycznej. Tendencja ta mieści w sobie wiele rozmaitych postaw artystycznych, dlatego trudno pokrótce ją opisać. Można jednak zaryzykować stwierdzenie, że jest ona w dużej mierze odpowiedzią na muzykę swobodnie improwizowaną, odnoszącą się z kolei odnosiła się do jazzu, w którym improwizacja często była środkiem, a nie celem. Swobodna improwizacja kładła nacisk na wyzwolone (od idiomów muzycznych) spotkanie grających. Nie negując tego faktu, improwizacja elektro-akustyczna przenosi punkt ciężkości z aktu dialogu na właściwości brzmieniowe i konstrukcyjne tworzonych struktur. Stąd wcale nierzadkie używanie wcześniej zarejestrowanych partii materiału czy twórcze wykorzystanie postprodukcji lub obfitej edycji materiału zarejestrowanego podczas improwizacji. Na wydanej w tym roku płycie „Live in Utrecht” dostajemy zapis koncertu, który odbył się w październiku 2007 roku. Ankersmit zagrał na analogowym syntezatorze i saksofonie altowym, używając gotowych nagrań przygotowanych na bazie dźwięków wydobytych z saksofonu i wypuszczanych podczas występu z laptopa. Chociaż w wywiadzie z początku 2006 roku artysta opowiadał, że nie łączy gry na instrumencie akustycznym i elektronicznym, to półtora roku później roku czynił to już nie tylko często i chętnie, ale i bardzo udanie. Możliwe, że duża w tym zasługa Valerio Tricoliego, z którym Ankersmit rozpoczął współpracę i który jest autorem owych przygotowanych wcześniej fragmentów wykorzystanych podczas koncertu. Gdy już mowa o współpracownikach, to wypada wspomnieć o innych partnerach Holendra: z Gert-Janem Prinsem oraz Giuseppe Ielasim, choć żaden z tych duetów nie zaowocował jeszcze płytą, to są one aktywne koncertowo. Ankersmit w ogóle nie spieszy się z wydawaniem albumów, co po części tłumaczy, dlaczego nie jest znany szerszej publiczności. Choć aktywny jako muzyk od co najmniej 9 lat, oficjalnym solowym krążkiem zadebiutował dopiero teraz. Miałem szczęście być na trzech występach Holendra. Powinienem być przygotowany, wiedzieć, co mnie czeka, gdy przystępowałem do słuchania tego koncertowego wydawnictwa. Niemniej jestem pod wrażeniem pomysłowości, odwagi w poszukiwaniu nowych form, a także faktu, jaką ilość detali i pozwalają odkryć kolejne przesłuchania. 38-minutowy koncert zaczyna się mocno: saksofon naciera (i do szóstej minuty nie odpuszcza) a spod niego wyłania się syntezator, potem następuje urwanie i tąpniecie niskiego dźwięku. Saksofon niedługo powraca, choć teraz nieciągły, ale stopniowo się zacieśnia. Zamęt trwa do siedemnastej minuty, gdy wszystko nagle cichnie i zostają szmery, nieśmiałe, które przeszywa (i zszywa) wysoka częstotliwość. Materia dźwiękowa w ciągu kilku minut ulega zagęszczeniu. Wyraźny staje się niski dźwięk, który podbudowuje (i lekko pulsując osadza) całość. W tej partii wrażenie wielopłaszczyznowości jest najwyraźniejsze, dzięki powtarzaniu części małych elementów, wobec ciągłych zmian kilku większych. Znów urwanie i znów skrawki syntezatorowe, tym razem służą one za czerwony dywan dla triumfalnie powracającego saksofonu. Brzmi on najpierw czysto, ale potem niczym podniszczone dudy. Połączenie techniki oddechu cyrkulacyjnego, która pozwala na wydobywanie długich nieprzerwanych dźwięków, z nawarstwianiem wcześniej nagranych partii składa się na zapadający w pamięć finał.